The foundation of the Benedictine Monastery of Our Lady of the Cenacle in the Diocese of Tulsa, Oklahoma is a timely response to the Year of the Priesthood. The following notes present something of the vision for this new monastery under the Rule of Saint Benedict. Please address all inquiries to Father Prior at the address given below. • in reparation for offenses committed against the Most Blessed Sacrament, and for the indifference of those who forsake Him, Who waits for us in the tabernacles of the world. • Holy Mass and the Divine Office celebrated in Gregorian Chant. • bringing to the traditional forms of the sacred liturgy a diligence and beauty worthy of the Holy Mysteries. 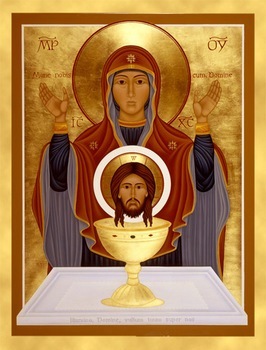 • commemoration of the Mother of God at all the liturgical Hours. • in filial obedience to the Bishop of the Diocese of Tulsa, Oklahoma. • in generous service of the clergy by means of hospitality given to priests, deacons, and seminarians for days of silence and adoration, for retreats, and for spiritual direction. • promoting Eucharistic adoration in the diocese of Tulsa. • direction of the movement for spiritual motherhood benefiting priests. • hospitality to priests, deacons, and seminarians. • both manual and intellectual work, according to the abilities and gifts of each one. • choir monks dedicated to the integral service of the liturgy and, normally, destined for the priesthood. • monks not destined for the priesthood who, imitating Saint Joseph, dedicate themselves to the ceaseless prayer of the heart in the daily tasks entrusted to them. • diocesan priests, sacerdotal Oblates of the monastery, living its charism and sustained by the monastic community in the midst of their pastoral labors. The sacerdotal Oblates, while remaining incardinated in their respective dioceses, will live according to the Statutes approved by the Bishop of Tulsa. • deacons and laymen, single and married: secular Oblates of the monastery. The monastery offers these women a suitable initial and ongoing spiritual formation. For Catholic men between the ages of 18 and 35. I can't help but believe that Our Lady of Knock has had a sure and hidden hand in constructing this wonderful post!! Praying for for the seed to fall on fertile ground. That's wonderful news, Father Mark. From what I can tell from Pennsylvania, Bishop Slattery is a wonderful bishop. My prayers for success are very much with you. Now, my question - will the monastery be accepting Oblates for whom distance is an obstacle for visiting? I'd love to know. Jon in Pennsylvania, thank you for writing. Once the monastery is established in a stable, permanent location and community life is underway, we will be able to accept Oblates. Distance from the monastery should not present an insurmountable obstacle. In the meantime, I thank you for your prayers and ask you to persevere in interceding for the foundation. Blessings from an Oblate at Clear Creek! It fills me with great joy to tell my friends from other parts of the country that the Diocese of Tulsa will have two Benedictine Monasteries lifting up the Work of God in our midst! Again, many blessings, and if there is anything that a secular friend of St. Benedict can do for you, please let me know. Of course, that's more wonderful news. I'm interested in all the details, but of course will be patient until you post them. In the meantime, I wonder if you might share a private e-mail address? I looked for one on the blog, and can't find it. I have a prayer request for you, and would like to make it privately if I can. This is tremendously good news. May God richly bless Bishop Slattery for his forethought, and his high regard for and investment in the contribution of monastic life! God bless you for answering this call. Thanks also to Fr. Z for posting about it. Where, exactly, will the monastery be? I am guessing this will be a Latin Mass Monastery? What a beautiful concept -- and in the Year of the Priest, no less! Certainly there are no coincidences with God. I think once it is properly underway, your monastary would make a wonderful and much-needed retreat for priests, restoring and refreshing their spirit and vocation in a spiritual and orthodox environment, as well! May God always bless you and this, your "vocation within a vocation". Excellent news - I wish you every success in this venture. Also, though I rarely comment on here, I do follow the blog keenly and really appreciate your writings. I will keep you in my prayers - and may I ask you to say a prayer for me as I discern a possible monastic vocation. Will be a miracle that our monasteries are united in the Internet, but also with our prayers. His presence and his message was a blessing for us in Brazil. If you can help our monastery with books and objects of the liturgy am forever grateful! Our monastery is great difficulties to buy the things needed for the liturgy of every day. Need benefactors. Need donors. I need help. Sorry to speak the truth. Our monastery is poor. The diocese does not help with money. And we have only 1 year of life. But the key is prayer that unites us all day - starting today in the Eucharist. Nous sommes très heureux avec votre message et les détails sur la vie du monastère. Nous avons le même charisme. Louez Notre Seigneur Jésus-Christ. Le Bienheureux Columba Marmion nous inspire aussi. Notre premier anniversaire a été inspiré par le fondateur de Pierre Qui Vire, le Père Jean Baptiste Muard. Notre monastère a été fondé il ya un an. Nous sommes une petite communauté et tout à faire. Notre monastère est pauvre. Nous n'avons pas de bienfaiteurs et nous n'avons pas reçu une aide financière du diocèse. Nous avons besoin de livres liturgiques, en particulier le Rite Extraordinaire (latin). Nous vivons une vie simple près d'une réserve forestière. Le site nous assure que le silence et l'isolement nécessaire à une vie monastique. Dom Emmanuel Marie – Sub Prior et Maître des novices. P.S. : Nous vous demandons votre adresse email pour la correspondance, s'il vous plaît. congratulations! I invite you to visit my channel so that, if you want, I could display a small piece of text to lead people to visit your blog. Sorry for not being able to leave this comment on a certain section you must have, I find it hard to figure out blogs...I also blame it on my bad eyesight. Would Our Lady of the Cenacle monastery ever consider receiving an Oblate who is also an Eastern Orthodox Christian? This is a wonderful development to pray for holiness of priests. Very excellent support for priests. Blessings be upon your religious Order. may Jesus bring you good vocations.